I dropped in to Moore college library today. Shades of Jesus entering the Jerusalem temple: it was full of buying and selling. I felt like driving out the chattering women with a whip. This was meant to be a sanctuary of quiet reading – and you’ve made it a den of noisy thieves! Anyhow, I had to go upstairs to find some quiet, but I did come across an interesting article in Currents in Biblical Research. 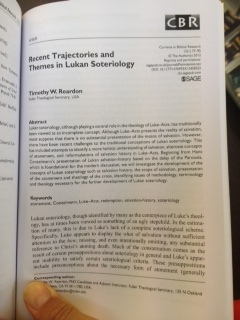 It’s a review, by Reardon, of Lukan studies in the past century, with a focus on the issue of ‘salvation’ (what scholars call soteriology). Traces lines of thought in scholarship from Conzelmann onwards. It’s a very succinct, well-written study. Easy to read. Insightful and open-minded. Good stuff. 1. There wasn’t much! Seemed like a sparse field of research. Not many new ideas being thrown into the mix. Not much to show for a whole century of work. Few evangelicals have even dipped their toes in the water. The main one who has – Marshall – didn’t get very far, hamstrung by too many of his own imported ideas about Luke’s message. 2. Reardon kept identifying assumptions that had limited the studies. Too often scholars are assuming Luke is working within the same conceptual grid as themselves, rather than trying to discover Luke’s own framework. Often scholars complain that Luke is not properly answering their questions – never mind if they were the questions Luke was interested in! In other words scholars have not been good at paying attention properly to this awesome 2-part work. 3. He concludes with a helpful list of directions where more work is needed. It’s pretty comprehensive! Luke’s view of the cross, of the future, his anthropology, his eschatology, his view of salvation history. All these areas need more work, according to Reardon. In summary, everyone agrees that ‘salvation’ is central to Luke’s interests – but little clarity has emerged about what salvation means in Luke-Acts. Reardon is pretty calm about it, but the picture is a bit bleak, isn’t it. Great article, very helpful for getting your head around the big issues in Lukan scholarship.